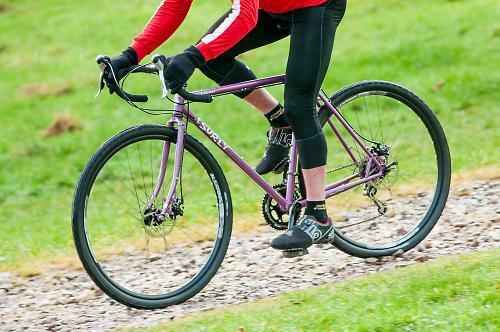 Surly’s Straggler is a sturdily built and eminently adaptable steel all-rounder. It boasts a handful of interesting design touches, an unusual amount of tyre room, plentiful luggage rack mounts and a very comfy ride. It has a strong bias towards rough roads and trail use, but weight-weenies should look away now. If you’re not sure why Surly’s bikes are dramatically different from the mainstream, take a look at their info-packed website www.surlybikes.com. It explains a hell of a lot about their design and build philosophy. It’s a very enjoyable read that takes you way beyond the marketing jargon you usually find on a bike maker’s website. 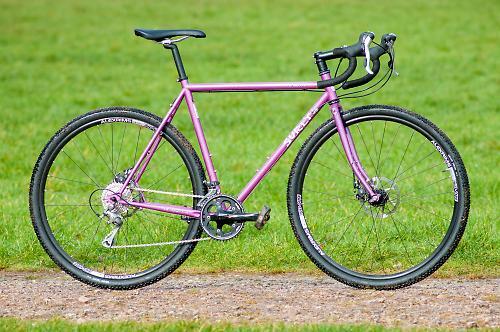 The Straggler is effectively a new approach to one of Surly’s most popular all-rounder bikes, the Cross-Check. The Straggler has disc brakes instead of the Cross-Check’s cantilevers, adding extra appeal for serious off road use, fully loaded touring or, in a perfect world, a combination of the two. Both are built around the kind of purposeful, adaptable and durable framesets Surly are known for, in this case inspired by cyclo-cross and touring applications, but the discs add to the Straggler’s appeal as a true all-rounder. There are other instant appeal factors in the frame design too. The rear dropouts are 135mm wide (mountain bike standard) and have a screw adjusters so you can use a single speed or hub geared wheel or simply to slide the wheel back for extra clearance around big tyres. There’s already far more tyre room than on most cyclo cross or touring bikes. Frame fittings include threaded bosses, doubled up on the fork dropouts, for full mudguards and every common type of front and rear pannier rack plus two sets of bottle cage bosses. As per usual with Surly, there are loads of closely spaced sizes to choose from, ten to be precise, from 42cm to 64cm. All get a 72 degree head angle, with seat angles ranging from 75 degrees on the 42 to 72 on the 64. Our test bike is a 56cm (22in) with a horizontal top tube length of 58cm. The frame shape is unusual. The top tube slopes down slightly to the head tube, which in turn extends about 2cm above the top tube. With the 30mm stack of washers on the steerer that gives you an option of a very high or very low handlebar position and good standover clearance. The Surly guys are refreshingly honest in how they describe the Straggler. It’s that all purpose adaptability that’s the key to its attraction. And that adaptability means it’s built to take a beating on all types of terrain, whether it’s laden with bags or stripped down to the metal and rubber. I tested the standard build from Surly’s UK distributor Ison Distribution. It weighed in at 11.9kg/26.5lb without pedals. That’s pretty close to the weight of a rigid forked mountain bike at around this price but not as capable as a mountain bike on really demanding terrain. The Straggler’s obvious rough roads and trails bias makes that comparison inevitable. It bridges mountain bike, cyclocross bike and touring bike, with both positive and negative aspects of all three. Most of its positive attributes are centred on the fact that it’s obviously built for durability, so you’re not going to be interested if you’re a weight watcher. The 4130 chromoly steel tubes are cleanly TIG-welded, the main triangle is double butted, the chunky 4130 chromoly fork has a lugged crown and dropouts with curved butted blades fitted with dual rack eyelets. If you have your own ideas about how you’d want to equip the Straggler, you could start with a frame and fork for £449.99, but the complete bike package is very thoughtfully equipped and looks like a good starting point for the sort of bike that could theoretically tackle pretty much any terrain you choose to ride it over. Surly’s Knard 41mm knobbly tyres are a strong indicators towards its intended territory, but there’s nothing to stop you fitting skinny treads if your bias is more towards road use. Inevitably it’s not a particular fast bike on the road with the 41mm tyres fitted, although it is remarkably comfortable and the Knard’s tread pattern features a round close-knobbed profile that runs surprisingly quickly on tarmac. 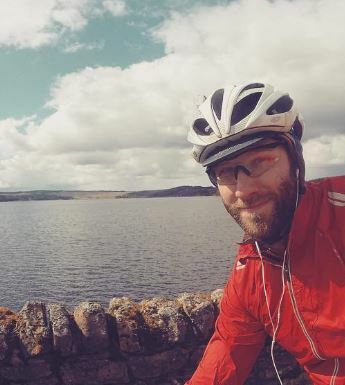 The weight means that climbing on the road is more sluggish than on a skinny tyred aluminium or carbon framed cyclo-cross bike, but it bears comparison with other steel-framed touring bikes. The Straggler’s high-speed handling on descents is massively confident in places where you’re not quite sure what the surface is going to present you with. The tyres are fat enough to allow you to run them fairly soft off road for more control and comfort, but you’ll quickly become aware of the limits when the going gets overly rocky or rooty. But away from truly difficult mountain bike terrain its trail handling is superb. The combined wheel and tyre diameter is 28.5in, an inch more than on a typical cyclocross bike and that helps in terms of creating an easier roll over the bumps, but there’s still plenty room for mudguards. The finishing detail of complete bike packages is well thought out. The parts package uses wheels with tough Alex DX-Lite eyeleted rims, 32 black stainless spokes and Surly’s own hubs, allen bolted up front, quick release at the back. The Shimano drivetrain mixes a 46/34 cyclocross crankset with Tiagra shifters and rear mech, CX70 front mech and an 11-32 ten speed cassette, a good option for off road use or laden touring. The brakes are the well proven and easy to adjust Avid BB7 cable pull discs, with full outer cables. The seat post and stem are from Kalloy; the saddle from Velo; and the handlebar the compact drop and slightly flared Salsa Cowbell. If you don’t like the ‘Glitter Dreams’ sparkling finish of our test bike you could go for the much more conservative ‘Closet Black’. The Straggler has a rock solid character in terms of both handling and have a go at anything durability. Sure, there are times when it feels like a bit of a lump, typically when you’re trying to keep up with a bunch of mates on skinny-rib road bikes. But there are also times when its steamroller personality becomes very welcome. On trails it’s inevitably much less skittish than a lightweight race bred cyclocross bike, and that’ll give you confidence to explore further afield. With a fast rolling set of touring tyres, it’ll be competing for desirability honours with lots of traditional touring bikes. 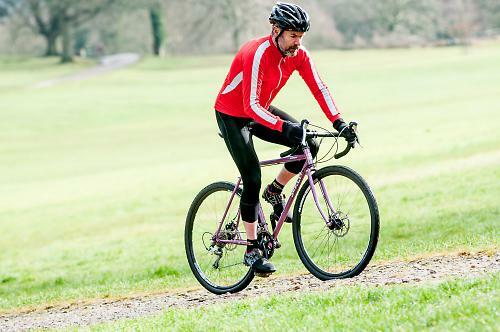 The braking is better than a lot of other disc equipped cross-bred bikes because it doesn’t flutter or judder: that’s presumably down to the hefty build of the fork and the bracing tube between the stays out back; adding weight has pros as well as cons. The Straggler is a bike for those who value a comfortable non competitive ride and a lot of adaptability in one bike. It’s not for those who obsess about weight or who are always in a rush. It could even be the only bike you need to own if you’re an all-round rider of the type who currently owns half a dozen bikes and is trying to trim the fleet back to a sensible number. Wonderfully versatile all-rounder that can hit the trails, the streets or the long-haul open road; it might be the only bike you need, except for all the others. Surly says "So what is this Straggler anyway? The easy answer is to say that we added disc brakes to a Cross-Check and this is close to accurate. People have asked us to make a disc version of our highly versatile Cross-Check for a long time now and almost everything about the two are very similar. Straggler is slightly different, though. The most obvious difference of course is that the Straggler has disc caliper mounts instead of rim brake studs. It'll accept rotors up to 160mm. The rear dropouts are unique, too. They're a partially closed horizontal design that accommodates singlespeed or geared drivetrains. They feature stop screws that thread in from the rear to further secure the wheel and to position the rear wheel for optimal shifting, plus a forward-mounted stop screw on the drive side to keep the wheel from slipping forward under the force of your gargantuan legs. The rear dropouts are spaced 135mm instead of 132.5mm like the Cross-Check simply because there are far more options for disc hubs in this spacing. Straggler shares all of the Cross-Check's braze-ons for fenders, racks and bottle cages. The Straggler's geometry is slightly different, with angles and tube lengths very close but not identical to the Cross-Check, but like the Cross-Check it's ready to take you just about anywhere. It's a day tripper and a weekender. It's a 'rough road' road bike. It's a cyclocross bike with no pretense about racing. It's a utilitarian townie. It's a light-duty touring bike. It's an all-weather commuter. And when you get tired of one set up, you can swap parts around and turn it into something else. We think that's pretty neat." We reckon that's a pretty honest assessment. Well, it's more feature laden than any other bike of this type and the build quality appears to be excellent. Surly's 4130 chromoly frame and fork tubes emphasise toughness over lightness. 72 degree head angle on all sizes. Seat angles vary to accommodate different stretch needs on different sizes. For those who like a relaxed ride posture with a comfortably efficient stretch, spot on. Very comfortable. Most bikes with 41mm tyres are comfy, but the frameset structure and ride posture add to this. Very efficient but inevitably the big tyres add a little squish on the road. How would you describe the steering? Was it lively, neutral or unresponsive? Relaxed and neutral. Very easy going handling feel. Certainly not race bred, but great with or without luggage. Nice big (but surprisingly fast rolling) tyres. Everyone liked the slightly flared Salsa Cowbell handlebar, and the long wheel base makes stability a highlight. Commuters and tarmac fans would mainly want faster tyres. Habitual off road riders will love it as it is. Amazingly stable with and without luggage. Great stability when meandering in traffic. Climbs like many other 26.5lb bikes! There'll be riders who'll want smaller and bigger gears but we think the range is ideal for the sort of rider the bike is aimed at. Well built wheels. Tyres fine for a mix of on and off road use. The emphasis is on durability rather than low weight. Everyone will have their own ideas about perfect wheels and tyres on the Straggler. The Knard 41s are not quick on the road, although they roll surprisingly well for a tyre designed for frequent off road use. Love the Salsa Cowbell bar. The Cowbell bar comes in narrower and wider widths on different sizes. Would you consider buying the bike? If I was looking for one bike that can theoretically do anything, yes. There are obviously faster and lighter road bikes around, and mountain bikes that lend themselves better to off road riding. The Straggler lies somewhere in between, closer to being a load hauling touring bike. It's especially suitable for occasional off road jaunts and can happily take skinnier tyres if you're going to commute or do fast club runs on it. Similar, but I would say this is more 'cross' biased than the Croix de Fer. There is more clearance for bigger tyres here, it has a true cross chainset, and the ability to fit a hub gear also gives more touring options than the Croix. The Croix is more at the road end of the spectrum, in my opinion. I hear you with the price though, this definitely seems a few hundred too much. I'd like to see the black frame, even the Surely site doesn't have pictures of that colour. And, it's a shame they didn't manage to fit the rear caliper on the chainstay, like the Croix does. Both frames look lovely, but this has a fair bit more tyre clearance than a Croix de Fer. I'd also wager it's less twangy when it's loaded up, and you can run it SS/fixed for really filthy winter riding. For £75 more when you're already spending a few hundred quid on a frame, I don't think that's terrible value. I like the features but that doesnt look like a 56cm frame, the head tube is tiny like a 50 or 52 road frame? Or does the large clearance of the fork require the head tube to loose some length to correct for it? Love (and covet) Surly bikes. I think it's interesting that their customer base are ultra-loyal and they have a great reputation for solidly built machines with no corners cut, sold through reputable dealers. Similar in that respect (and the steel) then to Genesis, but I'd agree with Rory above that there is more of a trail focus in the Straggler than the CdF. I suppose where Genesis make bikes that retain a road focus and track their lineage from proper racing rigs, Surly are a little closer to producing what their end user actually needs. Nothing wrong with either approach and both make lovely machines. I want one of these though (albeit w/flip-flop fixed/ss setup). The head tube is short so you can slam the stem. The fork comes with the world's longest steerer tube so you can blend in at Audaxes. It's a win/win. I've got an ally-framed EBC Evolution Evolution tourer which I've been thinking of retiring and stripping to put the components on a Croix de Fer for occasional tourist duties; no camping, two rear panniers and a rack bag maximum, does involve the odd bit off roughstuff. Now along comes Surly with this frameset which looks slightly more adaptable. Surly unhelpfully doesn't publish a sizing guide. Straggler or Croix de Fer folks? Workhard, surly geo are available on their websites, go have a look and compare geo with the equilibrium. Im not going to suggest a size as Genesis run a lot shorter in the TT than Surly. I love surly (have 3) but not taken by the straggler, dropouts look horrid to use. Its built just like the CrossCheck tho and they are ace, so a good bike it certainly will be. The Planet X Kaffenback 2 is almost half the price of this at £799.99 and is virtually the same thing! Any chance of reviewing it?! Looks fantastic if that's your bag & you want discs. I'd like a black one with wide drop bars (& Paul levers please) plus humongous mudguards for all-weather use. I've got a Surly Pacer frame / fork built up as a mellow day-tourer & it's so good we just sought out on eBay an (ex-display model) CrossCheck for £620 vs the £1049 RRP for girlfriends use - there are bargains around & Surlys don't change all that much year to year, great firm. I've been looking for a sturdy roadbike with disc brakes and ended up buying a Croix de Fer about a month ago and am really enjoying it. For the time being it's being pressed into service for the commute in place of my single speed Cotic Roadrat. My only gripe is that no firm seems to offer the best of both worlds with the disc calliper attached to chainstay like the Croix and the calliper on the front of the fork like the Roadrat to ensure ease in fitting mudguards. While the test bike seat tube measured close to 56cm by our usual method (BB centre to top of ST), Surly measures the seat tube to the top of its juncture with the top tube, making this a 54cm bike on their web site geometry tables. You guys all know Surley as a really comfortable bike. Are you aware they are all powder coated, not painted? Surley decals all disappear (flake off) in fairly rapid fashion because of it, but I believe powder coating is a most effective process and the very hard finish appropriate for use-and-abuse bicycle transportation. A weight conscious rider should move away from Surleys, cut down on his/her beer intake, and avoid bakeries. We won't be seeing each other except when you pass me ascending some hill. But I'll still be ok at the end of the day, 250 km down the road.